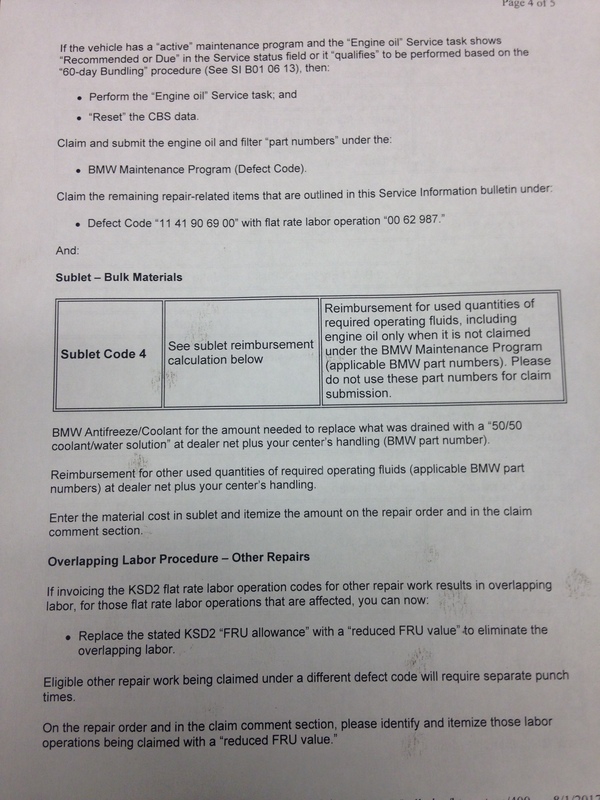 This Has been a big subject with everyone on my blog,,,,some of you guys have been asking about the bulletin about this repair,,,,so this is the BMW bulletin that us technicians work with,,,,I hope this helps some of you guys. I have a 2012 X1, I had heard the timing chain whine get worse over the winter, so I parked the vehicle the end of May, and slowly ordered the parts and the timing chain lock out kit for my mechanic. It was a good thing I did, I was talking to him the other day and he said the the top right timing chain guide had failed and was just kind of floating around. I was lucky I didn’t lose the engine. He said there were bits of plastic in the bottom of the oil pan. It was thanks to this blog that I was able to save my X1, hopefully I won’t have anymore issues with this! I have a 2013 328i with 85k miles, mostly highway if that makes any difference. At 77k miles, I got a low oil pressure warning light, towed 100 miles to the dealership and they couldn’t find anything wrong. Eventually replaced some kind of oil flow/distribution sensor of some kind as a starting point. Serviced at 80k as usual, with nothing appearing. Also took it in at 84k for a $150 diag fee because I could hear a whine, but since I was reading all of these threads, I wasn’t sure if it was just me worrying. Sure enough, 85k lead to another Low Oil Pressure warning light. Towed to BMW dealership, and 4.5 hours of labor to find out that the Timing Chain guide was broken. The question I have, is what questions to ask? I have researched as much as I can, but want to know what else to ask to be replaced whilst they are in there. Oil Pump? Oil Pump Chain? Anything else? The notion that these problems are isolated isn’t true – the SA spoke about the frequency of these (mainly X3’s). I understand the risks of owning a BMW compared to a generic car, but to think that another four-figure repair bill could pop up is nerve wracking to say the least. Unfortunately, I put way too many miles into the car which had lead to me being upside down in it anyway compared to my loan. Stuck. Hello – I stumbled upon this page and am so appreciative. I started getting this whine and saw your post and the SIB you posted. 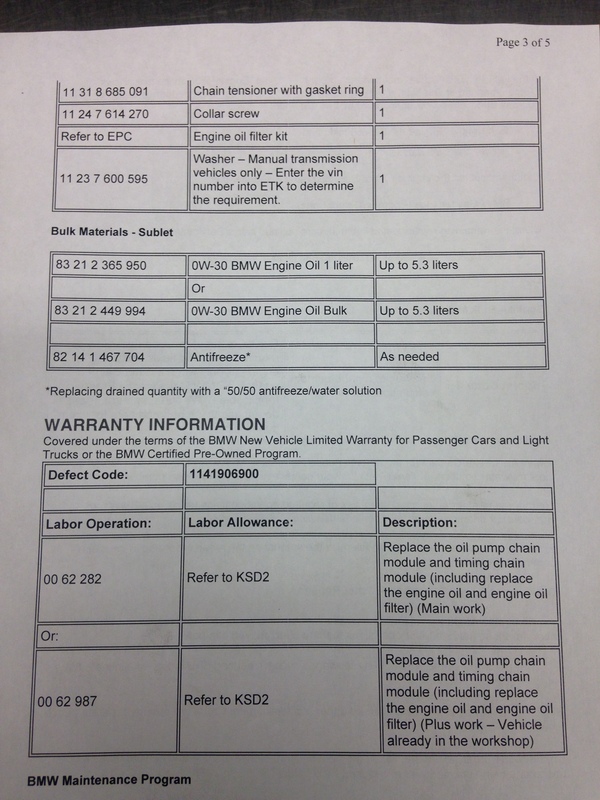 Took the car to BMW as I am almost at 7yrs and at 65k miles, and they said I will get the SIB 11 03 17 as outlined above. Car has been in the shop for a day, and tech said they’ll let me know if they see anything else, while they have the engine open. I understand they will replace the timing chain and guide rails and oil pump chain and guide. But I want to be smart when they call me and try to hit me up with other non-warranty issues. What else could they possibly find that may not be covered due to this issue? I suppose they could suggest I change the oil pump? What would be a reasonable cost while they are in there, and is there any reason to change it? I suppose I want to be smart and not let the dealer fleece me while they are at it. Any advice is appreciated and thank you for your good work. Thank you. What would be a reasonable price to pay BMW for that, given they are already in there? Thank you BMWtechnician. I received my car back after over a week and the repair went went well, no more whining There was no additional repair required beyond what was needed in the SIB. I really appreciate BMW for stepping up, that’s why I drive the brand. Thanks for the good work that you do here. You are helping many people out with your time. Cheers! Driving bmw 2013 x3 i28 to work. Stopped at traffic light and car indicated “drivetrain malfunction, with low oil pressure warning. I immediately stopped and had car towed to bmw dealer. The SA drove the car into BMW repair shop and promised calling the next day. Bmw called and told me the engine needs to be replaced. They said the timing chain guide had broken and pieces of plastic found in bottom oil pan. I bought the car at 72,000 miles from another dealer and currently at 100,000 miles. I have always changed the oil as recommended. I am thinking of taking it to a mechanic. The engine still runs and car starts but I don’t want to drive it. Any advise will help. Why does the dealer want to change the engine at $13,000? Am still financing the car and it still looks like new. Besides I can’t afford a new engine. Thought as much. Thank you for your quick response and feedback. I had timing chain issue and dealer replaced the timing chain drive and oil chain drive module where 50% of cost was covered by BMW Canada. Car was out of warranty but had only 55000 KM on it. Now that timing chain drive and oil chain drive has been changed, do I need to worry about it failing again or the new part fixes the issue? Please confirm which models fall within this recall from BMW and year model. Just happened to my car. Hello. I hope you will respond to this. I have a 420i N20 build date summer of 2014. I’m very worried it’s a second hand car I do hear some rattle at cold start but I’ve come to understand it’s “normal” until the oil pressure is there to support the chain tensioner. I have read around the net and my research seems to confirm that the tensioner works under pressure so at cold start you can hear a little rattle. I called my dealer about this too and he said that as long as it at cold start and only lasts a 10 to 20 seconds there’s no real worry, I should be hearing it when its warm. So uhm, just to be sure I’m asking you too… Should I get my chain tensioner / guides replaced ? my car has 50k KM on it. I drive it around in the netherlands area. quick question, I just did an oil chain to my 2014 F30 N26 xdrive and was checking the timing chain, I used a pliers and was able to pull the chain up to about 2~3mm. 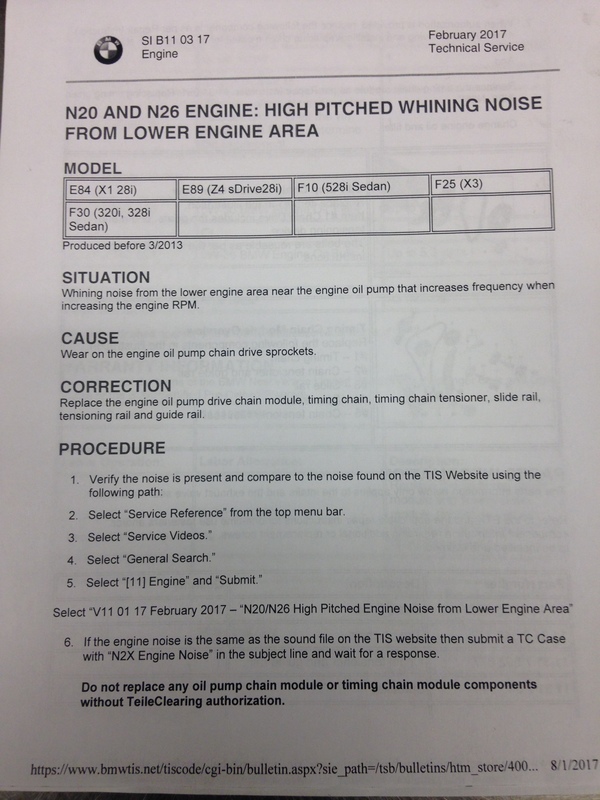 Read on other forums that it is normal while the engine is off, please correct me if I’m wrong, N26 have 50k miles. Yes that is normal,,,the chain tensioner is oil feed and will loose some tension when the engine is shut off. Yesterday (my 39th birthday) I was driving home from being out of town at a company event. 77mph in a 70mph zone, low oil pressure warning came up. Stopped as soon as I could and had it flatbed towed to the nearest indy shop – who just called and confirmed it’s the timing chain guide issue. The engine did re-start, didn’t sound bad at all (didn’t drive it at all) and I didn’t get the “drivetrain malfunction” warning. Called BMW NA to learn what they can do. In short, I have to pay to get it towed to the nearest dealer, where they’ll “diagnose” the problem. I’m praying it’s not a total engine swap. Thanks to this thread, I learned about the 7/70 extended warranty. Problem is, I’m at 70,800 miles…. Just heard from the BMW tech at the dealership – he’s advocating that this gets covered under the warranty since I’m only 800 miles outside of the 70k and well within the 7 years. My timing chain is loose, but they don’t know why that would cause oil pressure drop. No evidence of engine failure, but they said I’ll need an oil change, alignment, and oil pump (well over $5-7k). I contacted BMW North America and left a message with the case manager (Jason). Any idea on whether they’ll cover it??? Any idea on how a loose timing chain would cause oil pressure drop? It’s not showing an oil pressure warning anymore, oddly…. Thank you again for your reply! Sorry I wasn’t clear. I still need to talk to BMWNA to see if they’ll cover any of it as a goodwill. The tech said all of the services would be around $5 – 7k (everything). Hello BMWTechnician, Last week I just bought a nice X1 28I XDrive (produced in December 2013) and imported from Canada to Poland last year. The mileage is 33 000 Kilometers and the car looks and drives as new! Will BMW Poland have to carry out the warranty procedure if I ask them to? Would that be a problem…? I guess this is a worldwide warranty service right? No it’s not a worldwide warranty. Just visited my local BMW dealership this morning and they will take the car for service the 7th of May. 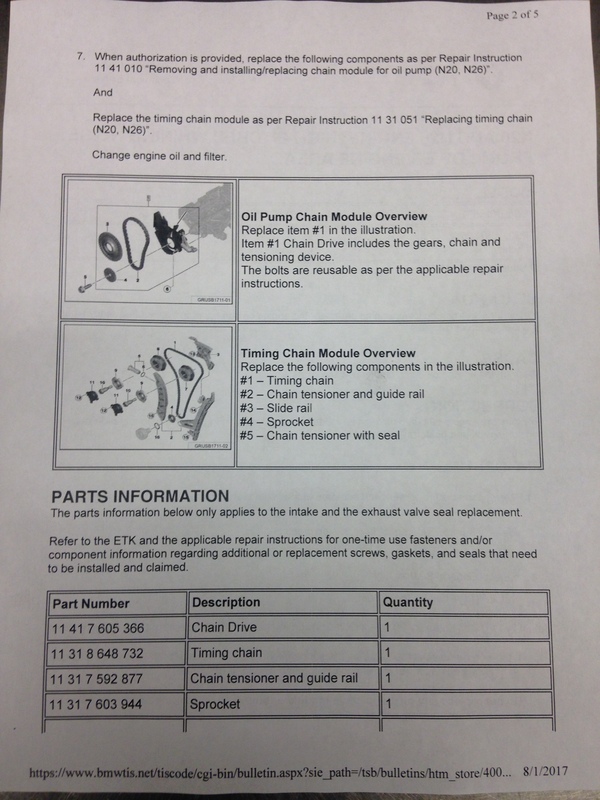 Then they will also take a closer look at the potential issue with the timing chain and oil pump. Followed this blog for a while. Currently at 60k miles on my 2014 320i. What’s the likelihood my dealer would replace these parts under the 7yr/70k service bulletin preventatively? I assume it’s mainly based on dealer discretion; just didn’t know if there were preventative cases out there?